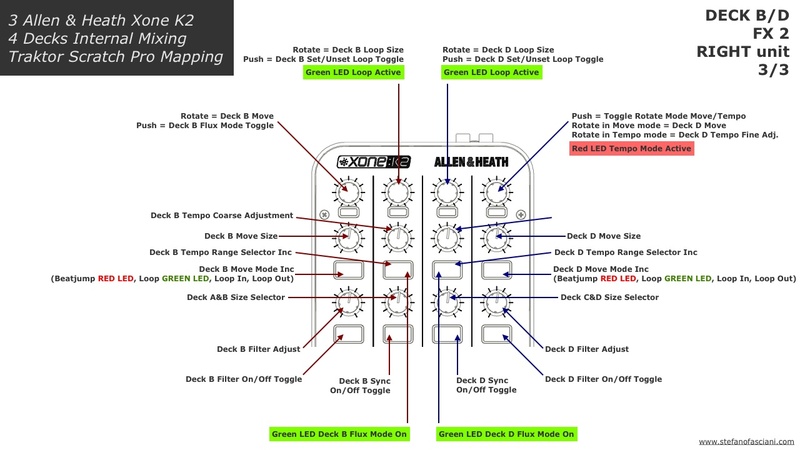 Allen & Heath Xone K2 is an extremely compact, powerful and versatile MIDI controllers with a built in 4 channels audio interface. 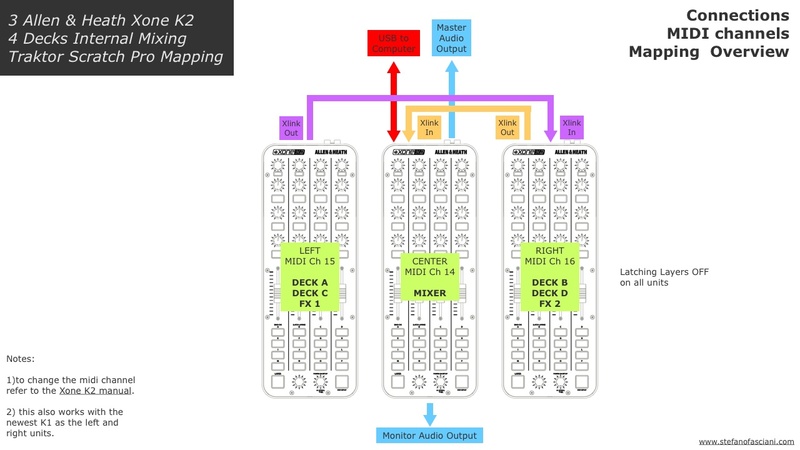 I’ve been using a variable number of these devices for mappping the control and visual feedback in real-time audio or audio/video applications within Max/MSP, Ableton Live, Max for Live, to control the looper of the Xone DB4, and also for djing with Native Instrument Traktor Scratch Pro. These devices don’t come with any out-of-the-box mapping (other than the one for the DB4) or labels on the individual interface elements. The effort required to implement the mappings is well compensated by the potential to develop very flexible and highly personalized hardware-to-software relationships. 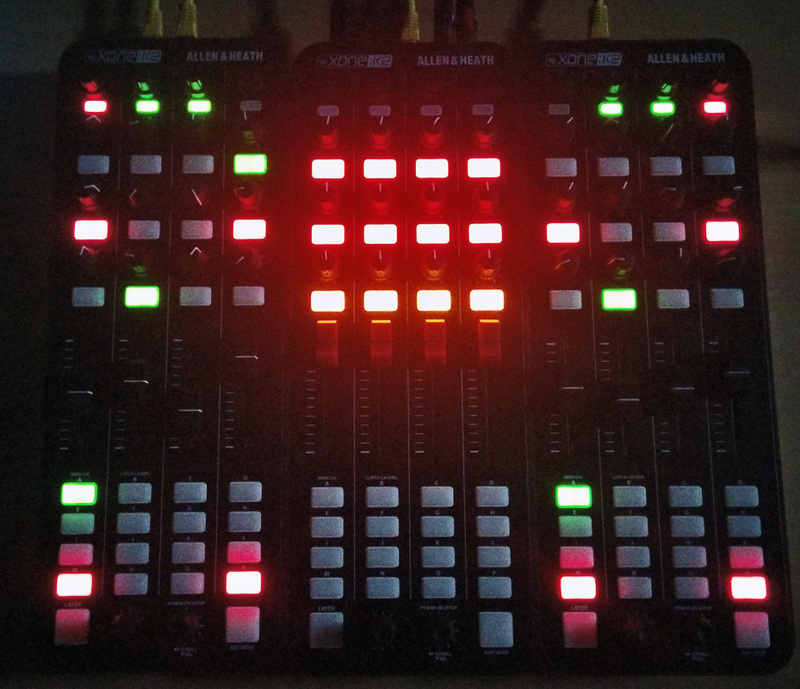 Moreover thanks to the Xlink connection it is possible to chain up to 16 Xone K2/K1, each working on a different MIDI channel, connect these to the Computer using only a single USB port (on a K1, K2, DB2, DB4). 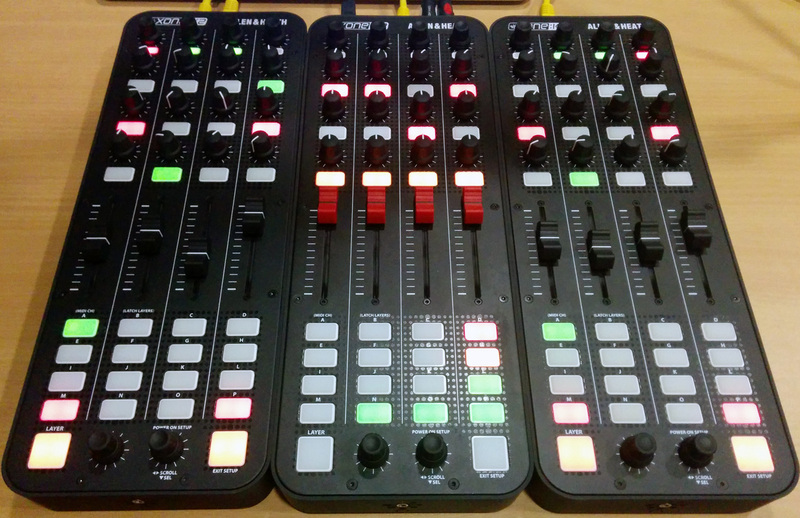 For djing with Traktor I find the K2 extremely versatile and modular, so that can be adapted to any situation. In the DJ booth these can be placed close together if there sufficient room, or spread around in the small free spaces in more busy scenarios. 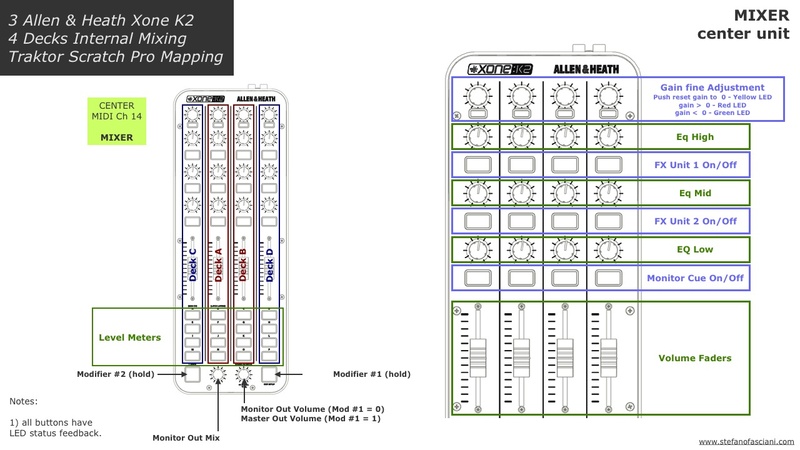 For instance I’ve used a single K2 for file browsing and effects control when using timecode vinyl, 2 K2 on the side of the DB4 to control 4 decks with external mixing on digital or analog mixers (audio out on the DB4/DJM900NXS internal sound card, or on the 4 stereo channels of the 2 paired K2). Recently for extreme mobile settings or when the provided mixer has only two channels I’ve implemented an internal mixing mappingin which a 3rd central K2 is mapped to the Traktor software. The lower group of button is not mapped to any function, their LEDs emulated the channel level meters. In the video below there’s a simple demo of this configuration, in which I just play around with four loops, filters and effects. 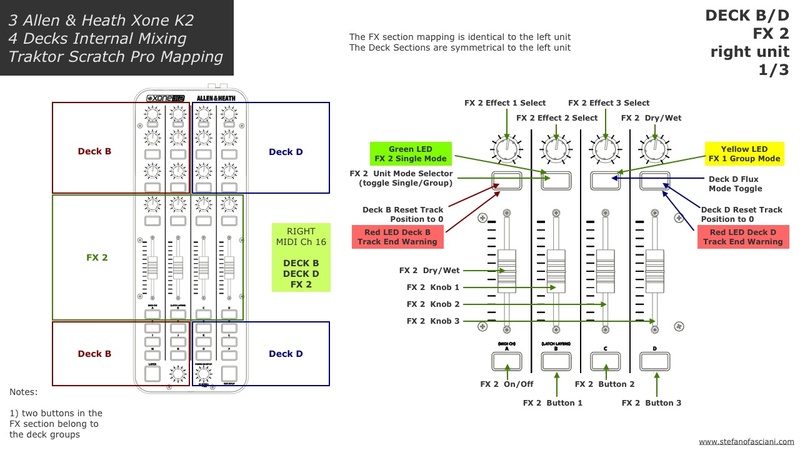 You can download the Traktor mapping .tsi file and the mapping manual from the download link below. 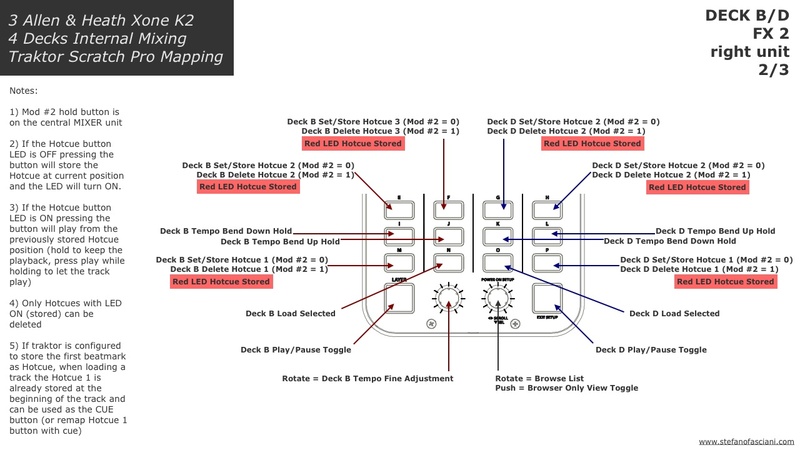 The mapping is developed following my personal Traktor use preferences and it is meant to be an example of how to implement this 3 K2 configuration, or a starting point to implement other mappings. 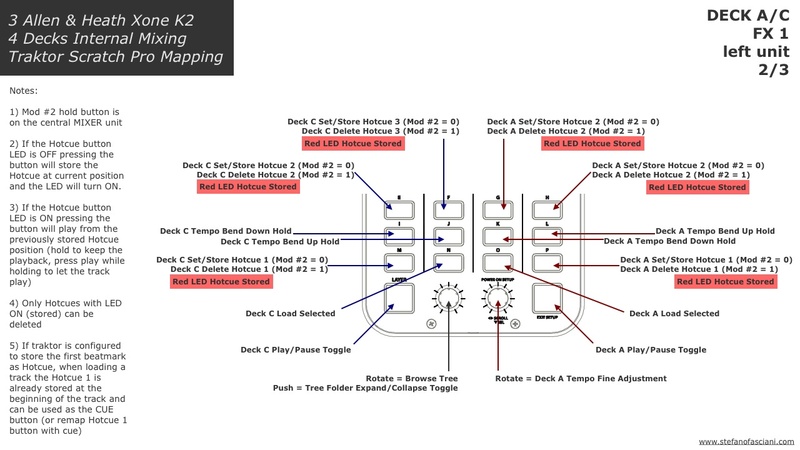 For instance I use the some encoders for variable size move (fast track browsing, cope with absence of search strip and rotary platter) and other for fine step tempo adjustment (otherwise with a MIDI control change faders with resolution 1/128 manual tempo matching is literally impossible). 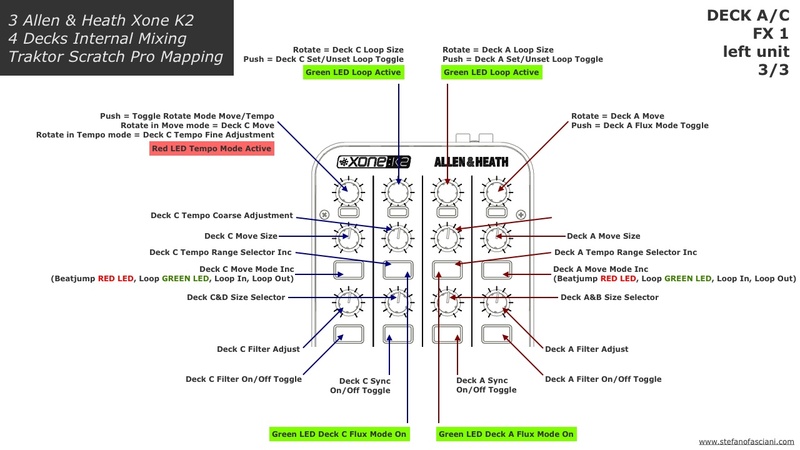 Tagged 4 decks, allen & heath, djing, k1, k2, mapping, modular, native instruments, traktor, xone.